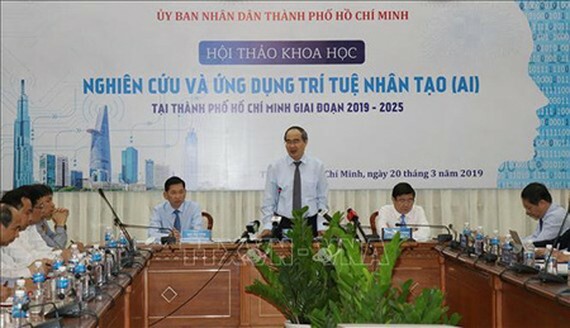 The Ho Chi Minh City (HCMC) Department of Information and Communications is going to cooperate with the HCMC Department of Science and Technology to offer guidance for the HCMC People’s Committee to form a steering committee on artificial intelligence (AI) research and implementation in the city from 2019 – 2025. This is the task requested by Vice Chairman of the HCMC People’s Committee Tran Vinh Tuyen to the two mentioned departments in order to carry out the direction of Secretary of the HCMC Party Committee Nguyen Thien Nhan made in the scientific conference ‘Researching and Implementing AI’. This new steering committee will consist of leaders from related departments and sectors in HCMC as well as senior experts in the AI field from universities, institutes, and businesses. The above departments also need to collaborate with the HCMC Department of Home Affairs to guide the People’s Committee in introducing operation regulations, organization structure, financial policies for this steering committee; building a database on professionals, organizations, businesses that are conducting studies or investing in the AI field. Vice Chairman Tuyen asked that the HCMC Department of Information and Communications continue its task of hosting an international conference on AI applications this May. From this conference, the new steering committee is expected to report and propose an action plan for research and cooperation programs on AI in HCMC from 2019 – 2025. Simultaneously, related agencies in districts of HCMC need to identify specific domains that can take advantage of AI in operation.